More than 300 Christian children in two high schools in Zhejiang province, which has been referred to as the "Jerusalem of the East" for its strong Christian presence, have been asked to fill out a form stating that they did not follow a religion, World Watch Monitor has been told by a trusted local source. While "it is normal for a school to ask parents to fill out a form which includes questions of faith when a child is first enrolled in school, for many years this hasn't been an issue," our source, who wished to remain anonymous, explained. Schools in China are government-controlled and financed and therefore Communist in ideology, and Christian children have sometimes faced "shaming" incidents, "but the extent of such shaming was to prevent them from joining the Communist Youth League, thereby denying them any of the perks that come with a progression to Communist Party Member later in life," World Watch Monitor was told. "In this case, however, the children were handed a questionnaire in class about faith, which is not normal. It seems this is part of the new push to identify Christians and give them pressure of one sort or another. "Children in this part of China would write 'Christian' because of 1) their innocence and 2) they come from families of fervent believers who do not compromise their faith." In the first school, which has around 200 Christian students, the teacher demanded they rewrite the questionnaire, stating that they had "no religion." But when filling out the next questionnaire, half of the children maintained that they were Christians. According to our source, following further warnings, in the end all but one child complied. In the other school, which has around 100 children, it was the class prefect who forced the Christians to resubmit their papers, stating that they had "no religion." Our source said children in China are pressured in a variety of ways: "In these cases it would be using words only. It seems teachers recently were tasked with pressuring children by separating them from the other students to 'counsel' or talk to them sternly about the 'consequences' of talking about being a Christian believer at school, urging them to write "no religion" on their questionnaire. This is for the child's sake and to limit any growth of Christianity among young people through evangelism or simply becoming known as the ones who could answer questions other pupils may have about Christianity." Children who do not comply are reportedly denied access to opportunities at school, such as being elected as class representatives for special events. They could also potentially face the danger of not receiving a leaving certificate from their school and therefore not be able to attend university. Such incidents are also recorded in the child's personal file, which is held by local government departments and the information can hamper their future employment opportunities, our source said: "Of course these are all hypothetical scenarios and would be determined largely by the level of involvement of the individual school, its teachers and principals, but generally the sense is one of bias against Christians." The pressure is also felt by parents, who worry about their children's prospects and fear they will abandon their faith. In February, China introduced revised regulations on religion, which included banning under-18s from attending church or receiving any religious education. In August, hundreds of church leaders signed a public letter, calling on the government to stop its "violent actions" against Christians. 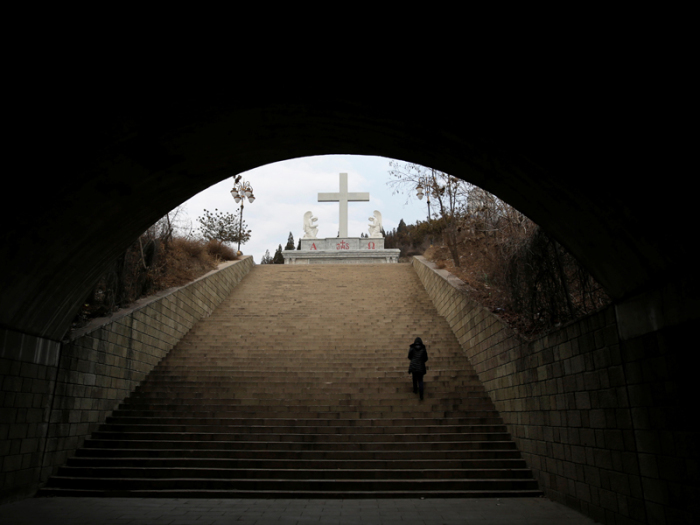 They cited the demolition of crosses on church buildings, which particularly affected Zhejiang, as well as removing expressions of faith like crosses hanging on Christians' homes, and forcing churches to join religious organizations controlled by the government. In the letter, they said these practices were not just "unjust" and an "abuse of government power" but also "infringe on the human freedoms of religion and conscience and violate the universal rule of law." Last week U.S. Rep. Chris Smith, R-N.J., said China was "taking a hammer and sickle to the Cross,"
"Burning Bibles, destroying churches, and jailing Muslims by the million is only part of the Chinese Communist Party's audaciously repressive assault on conscience and religion," he said, adding that the U.S. would respond by ensuring "a tougher China policy, one with widespread, bipartisan and even global support." This article was originally published at World Watch Monitor here.